"You have been a man of war, and have fought many battles, and shed much blood. My house shall be built by a man of peace. When you die, your son Solomon shall reign, and he shall have peace, and shall build my house." So David made ready great store of precious things for the temple; also stone and cedar to be used in the building. And David said to Solomon, his son: "God has promised that there shall be rest and peace to the land while you are king; and the Lord will be with you, and you shall build a house, where God shall live among His people." But David had other sons who were older than Solomon; and one of these sons, whose name was Adonijah, formed a plan to make himself king. David was now very old; and he was no longer able to go out of his palace, and to be seen among the people. "Let us make Solomon king at once, and thus put an end to the plans of these men." So at David's command they brought out the mule on which no one but the king was allowed to ride; and they placed Solomon upon it; and with the king's guards, and the nobles, and the great men, they brought the young Solomon down to the valley of Gihon, south of the city. And Zadok, the priest, took from the Tabernacle the horn filled with holy oil, that was used for anointing or pouring oil on the head of the priests when they were set apart for their work. He poured oil from this horn on the head of Solomon, and then the priests blew the trumpets, and all the people cried aloud, "God save King Solomon." All this time Adonijah and Joab, and their friends were not far away, almost in the same valley, feasting and making merry, intending to make Adonijah king. They heard the sound of the trumpets, and the shouting of the people. Joab said: "What is the cause of all this noise and uproar?" "Our lord King David has made Solomon king, and he has just been anointed in Gihon; and all the princes, and the heads of the army, are with him, and the people are shouting, 'God save King Solomon!' And David has sent from his bed a message to Solomon, saying, 'May the Lord make your name greater than mine has been! Blessed be the Lord, who has given me a son to sit this day on my throne!'" "If Adonijah will do right, and be faithful to me as the king of Israel, no harm shall come to him; but if he does wrong, he shall die." Then Adonijah came and bowed down before King Solomon, and promised to obey him, and Solomon said, "Go to your own house." Not long after this David sent for Solomon, and from his bed he gave his last advice to Solomon. And soon after that David died, an old man, having reigned in all forty years, seven years over the tribe of Judah, at Hebron, and thirty-three years over all Israel, in Jerusalem. He was buried in great honor on Mount Zion, and his tomb remained standing for many years. The great work of Solomon's reign was the building of the House of God. It was generally called the Temple. It was built on Mount Moriah, one of the hills of Jerusalem. King David had prepared for it by gathering great stores of silver, stone and cedar-wood. The walls were made of stone and the roof of cedar. Solomon had great ships which visited other lands and brought precious stones and fine woods for the building. Seven years were spent in building the Temple, and it was set apart to the worship of God with beautiful ceremonies in which Solomon, in his robes of state, took part. 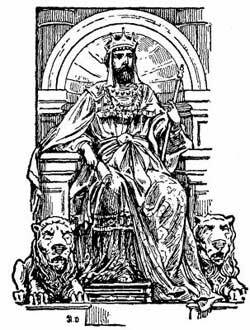 Solomon was indeed a great king, and it was said that he was also the wisest man in all the world. He wrote many of the wise sayings in the Book of Proverbs, and many more that have been lost.